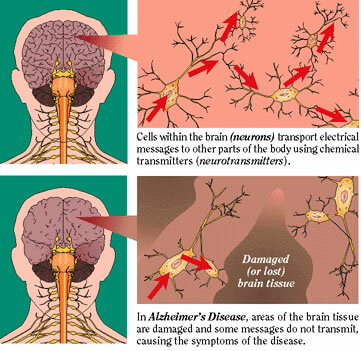 Transgenics was used to study the human disease Alzheimers. In 1993, the TSI Corporation created transgenic mice to evaluate the specific genes associated with this disease. The focus of this experiment was to construct these transgenic mice to test potential treatments for Alzheimer’s disease by looking at the expression of the protein APP (amyloid precursor protein). There are three forms of APP, APP695, APP751, and APP770, which were analyzed and recreated through constructs. Both natural and inducible promoters were used to make the APP gene constructs that had to be inserted into the mice, which consisted of APP695 cDNA, APP751 cDNA, and APP770 cDNA. The insertion was done using the ES method (embryonic stem cell mediated transfer). Following the embryonic injections, the embryo was placed in a surrogate mouse and allowed to grow and develop with the new genes. The amount and histopathology of APP in the grown mice were studied to examine the compounds which change the pathological course of Alzheimer's disease. No definitive claims were made in this experiment, but researchers kept using transgenic mice to study this disease. In 1995, a successful study was published by Athena Neurosciences, Inc. The PDAPP mouse was generated. Under control of the PDGFβ (platelet-derived growth factor β) promoter, the APP cDNA was over expressed in the mice, and introns 6-8 of the APP gene were present along with a mutation at amino acid 717 where phenalalaline took the place of valine. These mice have a very high level of APP protein, and develop greater Alzheimer-specific neuropathology. 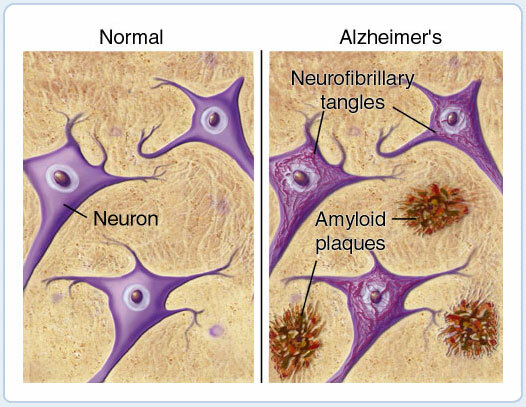 One of the symptoms shown is neuritic plaque, which forms and progresses from the hippocampus to cortical and limbic areas, which shows the regional specificity of what is seen in Alzheimer’s Disease pathology. A Morris water maze was used to further test the mice and assess amyloid burden and memory impairment. Results showed that these symptoms increase with aging, and the amyloid pathology in the PDAPP mice parallels that of Alzheimer’s. Following these studies, many other transgenic mice have been produced following the APP template to investigate causes and treatment of Alzheimer’s Disease. The Department of Cancer Biology at the Institut Génétique de Biologie Moléculaire et Cellulaire (IGBMC) in France employed transgenics to examine to expression of tumor necrosis factor-related apoptosis-inducing ligand, or “TRAIL” in transgenic mice skin. TRAIL is a protein that acts as a type II trans-membrane death ligand, and can stimulate apoptosis* in tumor cells. This means that TRAIL has high efficacy when dealing with tumor onset and growth. TRAIL greatly affects tumor development in cancer cells, which makes it an optimum candidate for use in anticancer therapy. The protein in humans is 65% similar to the protein in mice, regarding amino acids identity and structure. Homotrimers* are formed in TRAIL that bind to death receptors and decoy receptors. 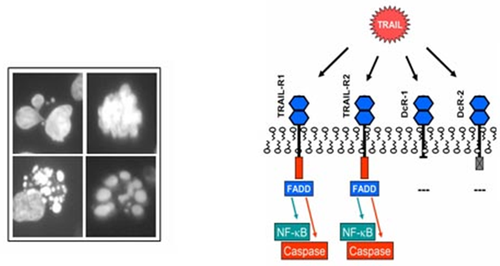 In humans, the DR4/TRAIL-R1/TNFRSF10A and DR5/TRAIL-R2/TNFRSF10B death receptors, and the DcR1/TRAIL-R3/TNFRSF10C and DcR2/TRAIL-R4/TNFRSF10D decoy receptors are used. Similar sequence homology* is found in mice in their receptors; the two decoy receptors are mDcR1 and mDcR2 and the one death receptor is mDR5/mTRAILR2. These significant similarities allow for mice to be used transgenically to obtain knowledge pertaining to humans about the TRAIL expression. Previous transgenics studies have proven that a TRAIL deficiency in mice leads to greater sensitivity to the production of tumors. Scientists Valerie Kedinger, Stephanie Muller, and Hinrich Gronemeyer of the laboratory in France recognized the varying TRAIL expression in mice and wanted to conduct further research which would evaluate the genes expressing TRAIL in vivo*, versus the previous in vitro experiments. Transgenic mice were engineered to obtain dermatological expression of TRAIL by making two-stage skin carcinogenesis* models in order to examine human epithelial cancer development. They wanted to specifically study the protection provided by the TRAIL levels, so mice were engineered to overexpress TRAIL in the skin and were put through the two-step chemical carcinogenesis protocol. Transgenesis was used in one of the first steps of this experiment. In vitro, mouse TRAIL cDNA (purely exons) was placed with the human keratin 14 promotor*. In order to create a more significant expression of the transgene, the first intron of the ß-globin gene was inserted in between the promoter and the cDNA. To ensure that the full transgene will be translated in the mouse, the SV40 3’ UTR (untranslated region) was inserted at the end of this new assembly. Through embryonic stem cell mediated transfer, this newly made fragment was inserted into the male pronucleus* of a fertilized mouse oocyte (immature egg cell),and then transplanted into a pseudo-pregnant* recipient female. Following the transgenesis, other procedures involving carcinogenesis, hybridization, and PCR were performed.